Designing Schools for the ‘Whole Child’ : Nature, Our First School | Snyder | transformative design. controlled outcome. Integrated curriculum (indoor/outdoor) is universally embraced as an invaluable form of inquiry-driven project based learning. So how can the design of hybrid learning spaces support this curriculum, and in doing so, promote the well being of students? 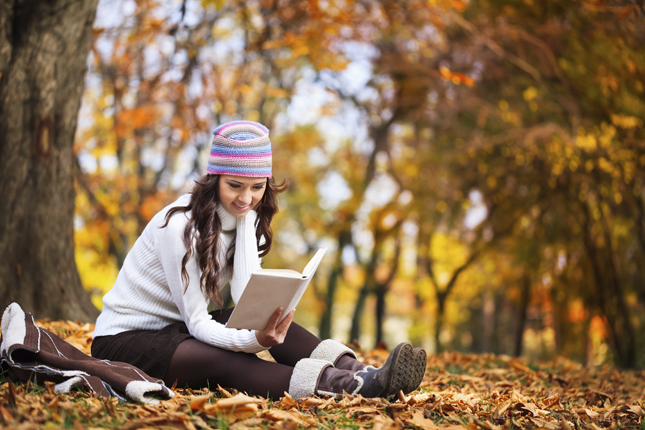 Trees, fields and an open sky support learning just as well as classrooms and science labs. Nature inspires a sense of wonder and exploration; after all, it was our first school. The outdoor learning movement has swept North America with integrated curriculum, along with day and overnight nature trips. Overnight trips are enriching, but how can students learn from nature while at school? Design outdoor spaces that support integrated curriculum. Outdoor learning spaces offer all the health benefits (reduced stress and anxiety), while allowing students to flex multiple intelligences. In nature, we find David Thornburg’s watering hole, cave and campfire, among other archetypal learning nooks – it’s an educational wonderland. 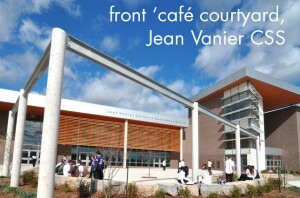 The integrated shop at Jean Vanier Catholic Secondary School (Halton Catholic District School Board) connects to the outdoor projects courtyard through garage doors where students may work independently or collaboratively. 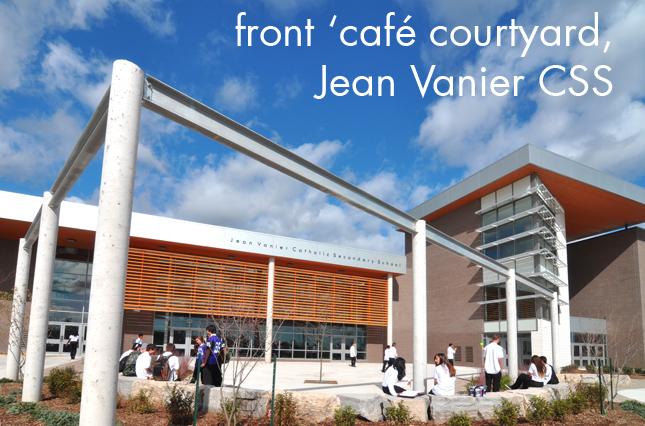 As well, the front ‘café courtyard’ extends the cafeteria space out to the exterior through a space trellis and armoured stone seating, where students can gather for lunch. 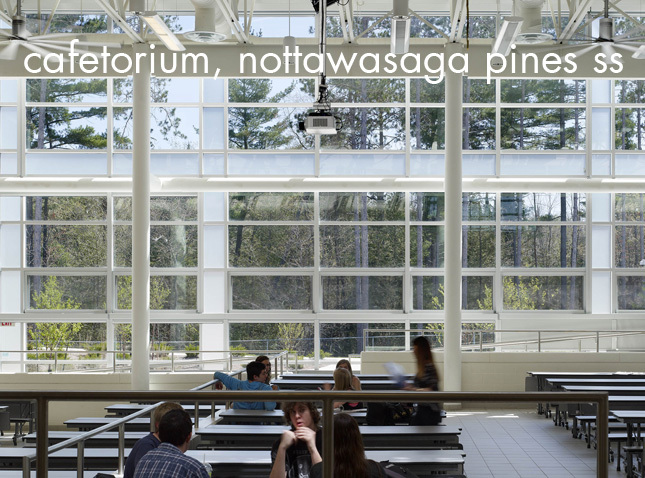 Nottawasaga Pines Secondary School realized the Simcoe County District School Board’s vision for a state-of-the-art high school that acts as a teaching tool for environmental stewardship. Taking advantage of the rich natural assets, Nottawasaga Pines is nestled among the creek and conservation lands. It is a prime example of site sustainability. 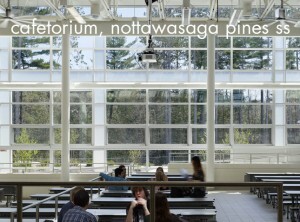 At Nottawasaga Pines, the vast curtain wall brings the woodlands into the cafetorium, the epicenter of student life and school identity. Students overlooking the cafetorium from the break-out space upstairs share this view of the woods as they pause and reflect. Site zoning is an important strategy in the design of outdoor spaces. At St. Conrad Elementary School (Toronto Catholic District School Board) in Toronto, the outdoor learning grounds were designed to give each school sub-group its own ‘precinct’. Kindergarteners have their own secure play area. The junior grade play area is closer to the building for supervision, and is animated with soft and hard surfacing for creative exploration. Senior grades have a scale-appropriate play yard at the base of the ‘hill’, with a stepped outdoor classroom cut into the hill for holding classes under the sky. We can design learning environments to enhance the physical health and well being of students. Outdoor learning spaces allow diverse learners to hone multiple intelligences while benefiting from the nourishment of nature.